1 Laboratory Oncology Unit, DR. B.R.A IRCH, All India Institute of Medical Sciences (AIIMS), Ansari Nagar, New Delhi, India. 2 Department of Pathology, Kalinga Institute of Medical Sciences (KIMS), Bhubaneswar, Odisha, India. 3 Department of Pathology, Veer Surender Sai (V.S.S.) Medical College, Burla, Odisha, India. Gorlin syndrome or nevoid basal cell carcinoma syndrome (NBCCS) is a rare autosomal dominant disorder with complete penetrance but variable expressivity. It affects nervous system, eyes, endocrine system and bones and characterized by multiple basal cell carcinomas (BCC), odontogenic keratocyst, characteristic facial appearance, skeletal abnormalities and malignancies of various organs. The prevalence is reported to be 1 case per 56,000-164,000 population [1,2]. Recent work has shown NBCCS to be caused by mutations in the tumor suppressor gene, PTCH1 (patched) gene found on chromosome 9q22.3. Approximately 60 percent of patients with a diagnosis of Gorlin syndrome are expected to have a mutation in the PTCH gene identifiable by sequencing . Herein, we report a case of 40 year female with many important clinical findings of nevoid basal cell carcinoma syndrome. A 40 year female presented with 12 years history of multiple pigmented lesions on the upper limbs, lower limbs and face. 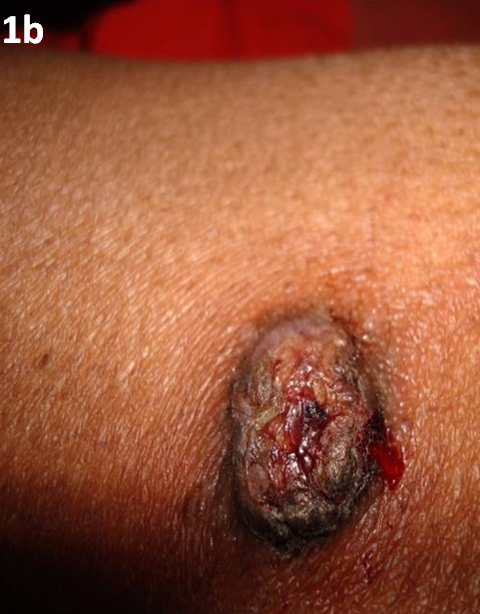 These lesions were initially small in size and suddenly increased in size since 6 months. On examination these were multiple darkly pigmented lesions of variable sizes ranging from 0.5cm to 2.5cm (Fig 1a). Few of these were ulcerated and crusted (Fig 1b). There is no evidence of local bone involvement or distant metastasis. The patient had hypertelorism and macrocephaly. Numerous tiny pits were observed on palms and soles. She had a past history of operation for ovarian tumor 10 years back. The histopathology of the ovarian mass revealed fibroma. Radiograph of skull and vertebrae showed calcification of falx cerebri (Fig 1c) and mild scoliosis. CT scan of the brain and ultrasound scan of the abdomen did not reveal any abnormality. Her mother and grand mother also had similar pigmented skin lesions. With these features the clinical diagnosis was made to be nevoid basal cell carcinoma syndrome. Histopathological examination of a representative specimen from one of the pigmented lesion showed tumor nests consisting of basaloid cells having mild cellular and nuclear atypia and arranged in a palisading fashion, dispersed throughout the dermis (Fig 2a). Few areas showed cribiform pattern (Fig 2b). 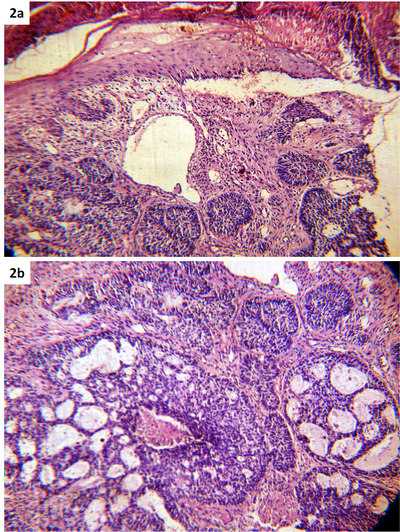 These histological findings were consistent with basal cell carcinoma. These histological findings were consistent with our clinical diagnosis of nevoid basal cell carcinoma syndrome. Gorlin syndrome should be differentiated from other conditions with multiple basal cell carcinomas. These include Bazex syndrome and Rombo syndrome. Hair shaft abnormalities along with atrophoderma are common in Bazex syndrome and trichoepethelioma in Rombo syndrome, which are not seen in Gorlin syndrome . Gorlin syndrome was first described by Gorlin and Goltz in 1960 . Kimonis et al. have proposed the criteria for the diagnosis of Gorlin syndrome . The characteristic findings in this condition are multiple BCCs, palmar and plantar pits, jaw cysts, bony abnormalities, and medulloblastoma. Multiple jaw keratocysts are frequently begun in the second decade of life with the mandible more commonly involved than the maxilla. Usually these cysts are asymptomatic; however, they may cause dental pain and swelling when they erode the bone. Histologically these cysts are odontogenic keratocysts . Basal cell carcinomas also appear early in life, usually in the third decade onwards and are numerous. However, the appearance of numerous BCCs at an early age and over sites not exposed to sunlight differentiates it from others. Palmar and plantar pits represent an aborted or immature attempt to form BCC. They are more visible on hands and feet after immersion in warm water for a few minutes. Other skin manifestations include facial milia, which can be numerous, and meibomian cysts in the eyelids. Sebaceous cysts and dermoid cysts are also common. Skin tags (especially around the neck) often have the histological appearance of BCCs but do not act aggressively. Approximately 60% of individuals have a recognizable appearance with macrocephaly, bossing of the forehead, coarse facial features. Most individuals have skeletal anomalies (e.g., bifid ribs, wedge-shaped vertebrae). Ectopic calcification, particularly in the falx, is present in more than 90% of affected individuals by age 20 years. Cardiac and ovarian fibromas occur in approximately 2% and 20% of individuals respectively. Cardiac fibromas are usually present at birth or soon after. They are mostly asymptomatic, but can cause arrhythmia or obstruction of cardiac flow, may cause torsion of the ovary but are not thought to affect fertility. Malignant transformation in ovarian fibroma is uncommon. Rhabdomyomas may occur at other sites as well as in the heart. Approximately 5% of children with NBCCS develop medulloblastoma (primitive neuroectodermal tumor [PNET]), generally the desmoplastic subtype. Peak incidence is at age two years . Life expectancy in NBCCS is not significantly different from average. The major problem is with the cosmetic effect of the treatment of multiple BCCs and to a lesser extent with dental cysts. In conclusion, Gorlin syndrome is often not diagnosed in childhood as many of the characteristic features develop later in life. Couples with a family history of this syndrome might consider genetic counseling before becoming pregnant. Frequent follow-up with doctors of various specialties is vital to achieve a good outcome. 1. Oro AE. Basal cell Nevus syndrome In: Fitzpatrick's Dermatology in General Medicine Wolff K, Goldamith LA, Katz SI et al edrs, 7th edn, McGraw-Hill, NewYork 2008:1042-48. 2. Totten JR. 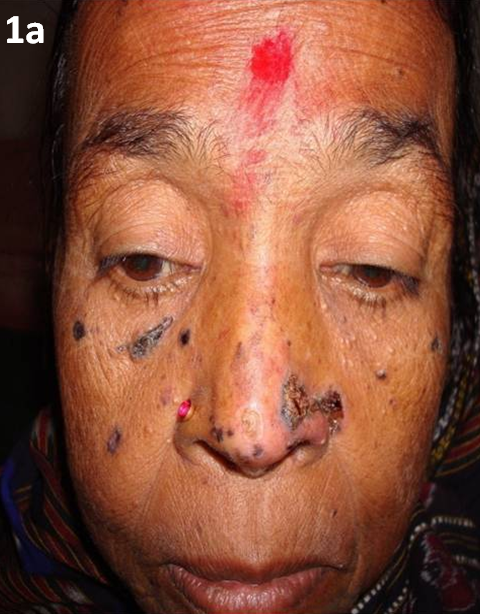 The multiple naevoid basal cell carcinoma syndrome. Cancer 1980; 46:1456-62. 3. K N Shivaswamy, T K Sumathy, A L Shyamprasad, C Ranganathan: Gorlin syndrome or basal cell nevus syndrome (BCNS): A case report. Dermatology Online Journal September 2010;16 (9): 6. 4. Gorlin RJ, Goltz RW. Multiple nevoid basal cell epithelioma, jaw cysts and bifid rib. A syndrome. N Engl J Med 1960; 262:908-912. 5. Kimonis VE, Goldstein AM, Pastakia B, Yang ML, Kase R, DiGiovanna JJ, et al. Clinical manifestations in 105 persons with nevoid basal cell carcinoma syndrome. Am J Med Genet.1997;69(3):299-308. 6. K Patil, VG Mahima, B Gupta. 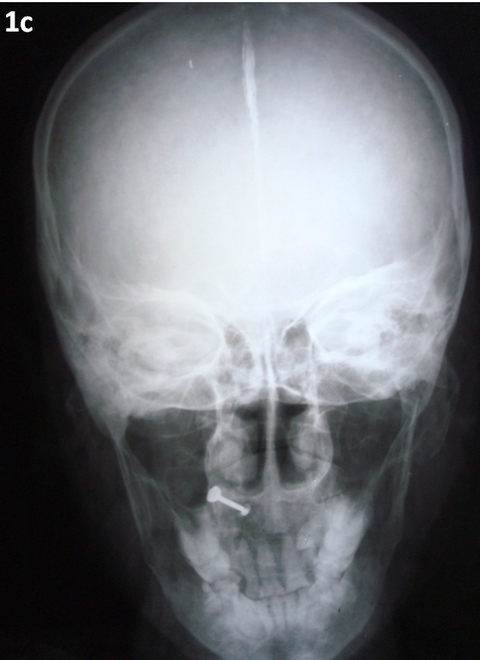 Gorlin syndrome: A case report. J of Ind society of pedodontics and preventive dentistry 2005; 23 (4): 198-203.